A new study finds that zebrafish can learn from other zebrafish, thus demonstrating social learning. Learning is important to all animals. Some acquire knowledge first-hand through deduction or trial-and-error, but these strategies carry risks, especially when the knowledge concerns discriminating good food from poisonous food or predators from harmless animals. Individuals in some species acquire information indirectly by watching others of their own kind. This social learning allows one animal to learn about its environment without taking unnecessary risks by learning the lesson directly for itself. Researchers from the Konrad Lorenz Institute of Ethology of the University of Veterinary Medicine in Vienna tested whether zebrafish use social learning to assess risk. Sarah Zala, Ilmari Määttänen, and Dustin Penn compared the boldness of domesticated zebrafish to their more timid wild counterparts. They found wild zebrafish became emboldened after interacting with domesticated zebrafish, but the effect did not occur in the other direction. Domesticated zebrafish that came into contact with timid wild zebrafish did not become more cautious. The study is published in the June 2012 issue of Animal Behaviour. The researchers tested the reactions of fish to a moving object, scoring their responses on a scale from "shy\ to "bold.\" Fish that closely approached the object were classified as "bold," while those who remained near the back of the tank were labeled "shy." Zala and her colleagues noticed that wild zebrafish exposed to domesticated fish were bolder and less likely to avoid the moving object than wild fish with no exposure to domesticated fish. However, domesticated zebrafish did not become less bold after interacting with timid wild zebrafish. The results show zebrafish use social learning to assess risk. The fish observe the behavior of other individuals and change their own behavior accordingly. The findings also support the hypothesis that social learning should be strategic rather than indiscriminate. Zebrafish were able to adapt their social-learning strategies to the costs of a perceived risk (the moving object). 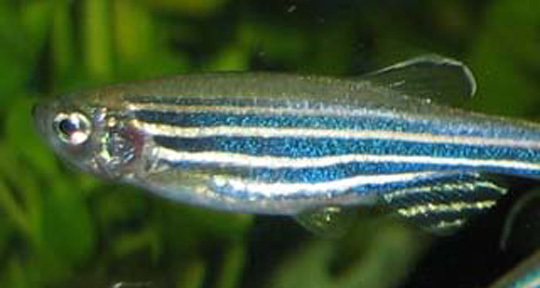 Zebrafish are already popular model animals in many laboratories. This study, in demonstrating differences between wild and domesticated zebrafish, should be useful in designing future experiments on the development and evolution of social learning.